This entry was posted in car dents dent removal paintless dent repair and tagged auto dent car car dent repair dent removal Dent repair door dent door ding fix dent mobile dent repair mobile paintless dent repair onsite paintless dent repair paintless dent paintless dent removal paintless dent repair paintless dent repair bellevue paintless dent repair seattle paintless dent repair washington PDR PDR bellevue PDR seattle vehicle vehicle dent on June 10, 2010 by admin. 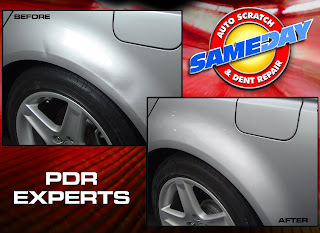 When the surface of the paint is not broken, most dents can repaired using a process known as Paintless Dent Repair or PDR. A quality paintless dent repair is the preferred method for dent repair because the factory finish remains intact. No “bondo” or filler is used and technicians do not damage the underside of vehicle panels.